This is a tentative list of Basque saints. The primary characteristic is their birth in a part of the Basque Country. 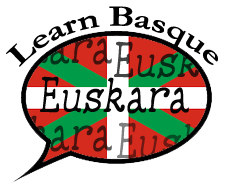 Some identified with being Basque and they spoke Euskara, while with others it is less certain. Fermin is said to have been the son of a Roman of senatorial rank in Pamplona in the 3rd century, who was converted to Christianity by St. Honestus, a disciple of St. Saturninus. According to tradition, he was baptised by Saturninus (in Navarre also known as Saint Cernin) at the spot now known as the "Small Well of Saint Cernin" Fermin was ordained a priest in Toulouse and returned to Pamplona as its first bishop. On a later preaching voyage, Fermin was beheaded in Amiens, France; and is now considered a martyr in the Catholic Church. It is believed he died on September 25, AD 303. There is no written record of veneration in Pamplona of the Saint until the 12th century. Saint Fermin, as well as St. Francis Xavier, are now the two patrons of Navarre. At Pamplona, Saint Fermin; is now sometimes said to have met his end by being dragged through the streets of Pamplona by bulls, a fate more commonly attributed to his mentor, Saturnin. 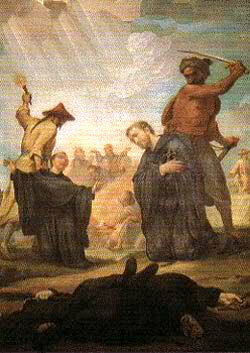 Franciscan martyr of Japan. 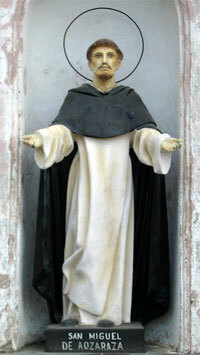 He was born at Bergara, Gipuzkoa and became a Franciscan in 1586 . Martin was assigned to Mexico and Manila, in the Philippines, before serving in Japan. He was crucified at Nagasaki and was canonized in 1862. 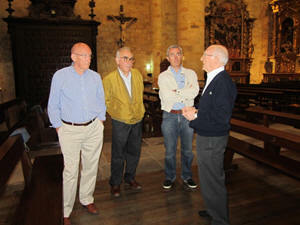 St. Ignatius was born in the family castle in Gipuzkoa, the youngest of 13 children, and was called Iñigo. When he was old enough, he became a page, and then a soldier of Spain to fight against the French. 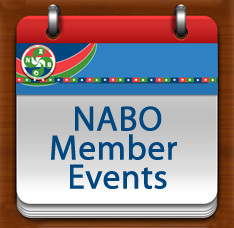 A cannon ball and a series of bad operations ended his military career in 1521. While St. Ignatius recovered, he read the lives of the saints, and decided to dedicate himself to becoming a soldier of the Catholic Faith. Soon after he experienced visions, but a year later suffered a trial of fears and scruples, driving him almost to despair. Out of this experience he wrote his famous "Spiritual Exercises". After traveling and studying in different schools, he finished in Paris, where he received his degree at the age of 43. 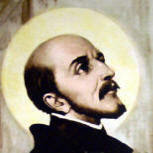 Many first hated St. Ignatius because of his humble Lifestyle. Despite this, he attracted several followers at the university, including St. Francis Xavier, and soon started his order called The Society of Jesus, or Jesuits. There are 38 Jesuit members who have been declared Blessed, and 38 who have been canonized as saints. He died at the age of 65. Born in the family castle of Xavier, near Pamplona in the Basque area of Spanish Navarre on Apr. 7, he was sent to the University of Paris 1525, secured his licentiate in 1528, met Ignatius Loyola and became one of the seven who in 1534, at Montmartre founded the Society of Jesus. Working against great difficulties, language problems (contrary to legend, he had no proficiency in foreign tongues), inadequate funds, and lack of cooperation, often actual resistance, from European officials, he left the mark of his missionary zeal and energy on areas which clung to Christianity for centuries. 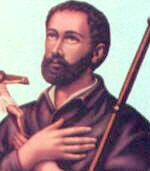 He was canonized in 1622 and proclaimed patron of all foreign missions by Pope Pius X. F. D. Dec. 3. Saint Vincenta Maria Lopez y Vicuña was born at Cascante, Navarre Spain in March 24, 1847. Vicenta had a happy childhood. She was a daughter of a famous lawyer, reared in a Catholic home and educated in Madrid. She may have had a good chance of living a comfortable life yet she chose the way of austerity and sacrifice. Vicenta’s uncle was a priest while her aunt was a nun who founded a home for domestic servants. This perhaps, fostered her attraction to religious life. At 23, she too became a nun and organized a group of ladies to protect and promote the welfare of the working girls- This was the beginning of the Sisters of Mary Immaculate. Along with this, Vicenta Maria founded several foundations, technical training schools, hostels, canteen, and provided these working girls boarding houses while they are away from home. She was a mother and homemaker to them, helping and teaching them in the ways of the Lord. Her congregation spread throughout Spain and other parts of Europe as well as in Latin America. She endured many trials and difficulties which she faced with courage and faith. Saint Vicenta Maria died on December 26, 1890. Sixty years after her death and through numerous graces obtained through her intercession. Bizi da oindik ala urten eban mundu onetatik? 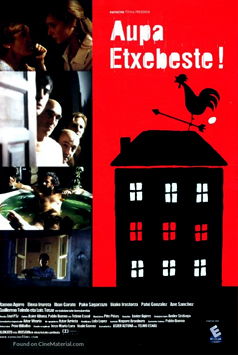 Desiua etxata falta, neure Amaren letra azartua ikusteko; urte bat eta erdi da iya, nere Amaren notiziarik eztauka(da)la. Asarratuta dago nigaz, ala aiskide gera? Gorroto guztiyak alde batera itxi bihar dituguz Mariya Birjiñiagaz aiskide izateko. Nere partetik behintzat maite dot nere Amatxo, eta alperrik otzak izan nere oraziñuak. Jaungoikoaren aurrian presente eukiten dot gure Atso piña, eta Ama Birjiña Mariyari eskatuten deutsat, libratu deiyela peligru guztietatik, ezteiyola itxi pekatuan jausten, eta eriotza on bar emon deiyola. Jaungoikuaren arpegi ederra zeruan ikusteko sekula guztiyetan. Amen. Akabatu da sermoia. Amatxo, alkar zeruan ikusten garianian erdera berba egin biarko dogu, zergaitik euskeria ia aztu da. " Allí hablar castellano, Madre; no puede vascuentze, y así con soldados aprender castellano es necesario. Usted, Madre, ahora vieja, difícil aprender castellano, yo creer, y mucho doler cabeza; pero ahora no aprender, y después el Madre hablar no puede a la hijo en el cielo. Entender, Madre, o no entender? Ni bizkor eta osasunagaz nabil. Urtebete baño geiyago da etxe baten naguala, eta palaziyo eder onek lastozko tellatua dauko, kakamasazko ormia, kañazko postiak, kañazko kuartoiak eta kapiriyuak, kañazko atiak; eztauko suelo bat baño, eta au da lurrekua. Palaziyo aundi onetan Erregiña berian baño obeto bizi naiz. "Por eso no tener cuidado, Madre. El hijo bien vivir; yo no tener envidia del Reiña"
Illunduko dau eta orregaitik asko da gaurko. Konke ondo bizi, Ama, errosariyo senduari ez itxi eskuetatik jausten, eta erregutu asko berorren seme bakartxuagatik. Gorantziyak aide guztiai eta sazerdote jaun guztiari.
" Yo ser su hijo humilde." Mixel (Michael) was born on April 15, 1797, the eldest son of Arnold and Gratianne Garicoits. They were poor and Michael was hired out as a shepherd boy to a farmer. His desire to become a priest always met with "No, we are too poor" by his parents, but his grandmother talked the matter over with the parish priest. Through his efforts Michael earned his expenses for college by working after school hours for the clergy and in the bishop's kitchen. Also known as San Miguel Gonzalez de Aozaraza de Leibar. 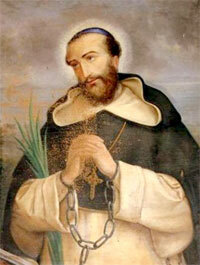 He was a Dominican friar, theologian, missionary and martyr. In 1635 he began working as a missionary in the Philippine Archipelago. In 1636 he joined a secret missionary expedition toOkinawa, Japan to help Christianize the Japanese who were persecuted by local authorities. He was arrested upon arrival and imprisoned for a year. He was then transferred to to Nagasaki and condemned to death. He refused to renounce his faith and was hanged upside down with his head in a pit for three days and finally was beheaded on September 29, 1637. He was 39. This is a table of given names based on Roman Catholic epithets of the Virgin Mary. Such names are popular in Iberian culture, mainly as women's names. They may derive from feast days celebrating the life of Mary (Asuncion), from miracles attributed to her (Pilar), from abstract qualities (Mercedes) or from places associated with a certain cult or image of Mary (Lourdes). 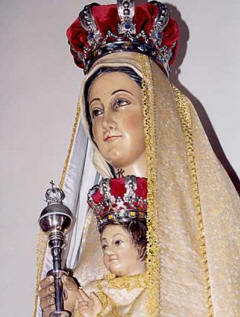 Our Lady of Liernia, the Basque patron of mothers without milk or who are unable to conceive. Elko, NV – July 2012—The Balentin Berriotxoa (originally in standard Basque Berrio-Otxoa) Santuaren Kofradia of Elorrio, Bizkaia has donated a statue of Saint Balentin Berrio-Otxoa to be shared by the Basque communities of Elko and Mountain Home, Idaho in hopes of establishing a lasting tradition of honoring the Basque Saint as well as strengthening bonds with the Saint´s birthplace of Elorrio in Bizkaia, the Basque Country. As a part of the Elko Euzkadunak Club´s 49th National Basque Festival on July 6, 7 and 8, 2012, mass being held at the Elko City Park at 11 a.m. will introduce the life of Saint Balentin Berriotxoa, patron saint of the Basque province of Bizkaia, and will receive the statue recently brought to the American Basque communities from the Basque Country. Saint Balentin Berriotxoa statue donated to the communities of Elko and Mountain Home, Idaho (the latter the home of some of his U.S. relatives). 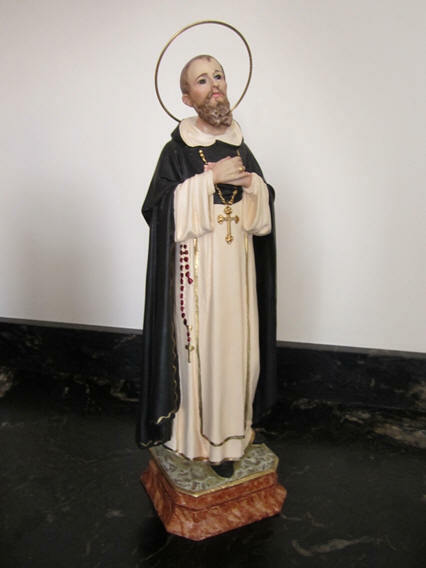 Born in 1827 in the town of Elorrio in the Basque Country, Balentin Berriotxoa entered the Dominican order of priests and set out for Asia to fulfill his life work. He was later ordained a bishop in Ninh-Cuong Vietnam. In 1861, he was beheaded in Vietnam, along with 116 other martyrs, for refusing to renounce Jesus. 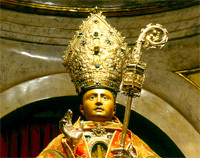 Pope Jean Paul II canonized him as St. Balentin Berriotxoa at a ceremony in Rome in 1988 in which a group of Berriochoa relatives from Idaho were in attendance. The project to incorporate Saint Balentin Berriotxo into the U.S. Basque community festivals was inspired by the late Bishop Karmelo Etxenagusia, Auxiliary Bishop of the Diocese of Bilbao and native of Iurreta, Bizkaia, whose wish was that there would someday be a presence and devotion to the Saint here in the U.S. which he saw as fitting since there are so many Catholic Bizkaians and descendants of Bizkaians in the Northwestern United States. Friends of Bishop Etxenagusia have pursued his idea by carrying out research on which Basque communities were the most interested in joining the effort and with great satisfaction, the statue, which had previously travelled to Colombia to serve as a model for a rendering of the Saint, has been hand delivered to Elko for the 2012 festival weekend. The Basque clubs of Elko and Mountain Home, the Elko Euzkaldunak and the Euskal Lagunak Club, look forward to working out the details of sharing the Saint Balentin Berriotxoa statue and creating lasting traditions. Following the tradition of the Basque Country, Chino area Basques have adopted their own patron saint, Mixel Garikoitz, who they celebrate in conjunction with their annual festival Labor Day weekend. In December 1823 he was ordained priest in Bayonne cathedral by Bishop d'Astros. Michael's first assignment was at Cambo where he remained two years. He did much to revive religion there, combat Jansenism by the custom of frequent communion as well as by introducing Sacred Heart devotions. Father Garicoits' next call was to a professorship in the senior seminary for priests at Betharram, and then to be superior. In 1838, Father Garicoits drew up a constitution largely based on that of the sons of St. Ignatius. Like them, his missionaries were to take life vows and to spread far and wide. Associates gathered round him at Betharram, and all seemed promising, when the bishop disapproved of his idea of founding a new congregation. Not till 1852 was the community allowed to choose its own superior, and even then it was tied down by regulations which hampered its activity. Father Garicoits submitted, but with a heavy heart. He died on Ascension day, May 14, 1863. Fourteen years later the Society of Priests of the Sacred Heart of Betharram was approved by the Holy See on the lines the founder had laid down. 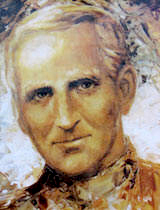 St. Michael Garicoits, who was at one time spiritual director of the Basque house of the Daughters of the Cross at Igon, received much encouragement in his foundation from St. Elizabeth Bichier des Ages, and he was all his life a close friend of her congregation in the Basque country. Both of them were canonized in the year 1947. His feast day is May 14th.